Afraid of flying—or unable to fly—but still want to visit Japan? No problem! While you won't find rail or road links to this island nation, there are a number of ferries, freighters and cruises that can get you to Japan—if you're willing to take the time! Your optimal route just depends on where you start! With a population of over 24 million, Shanghai is often considered the showpiece of China's economic explosion. Fittingly, there are two ferries operating between Shanghai and Osaka, Japan: the Su Zhou Hao and the Xin Jian Zhen. Whichever you choose, the journey takes roughly 45 to 46 hours, so it's no quick trip! 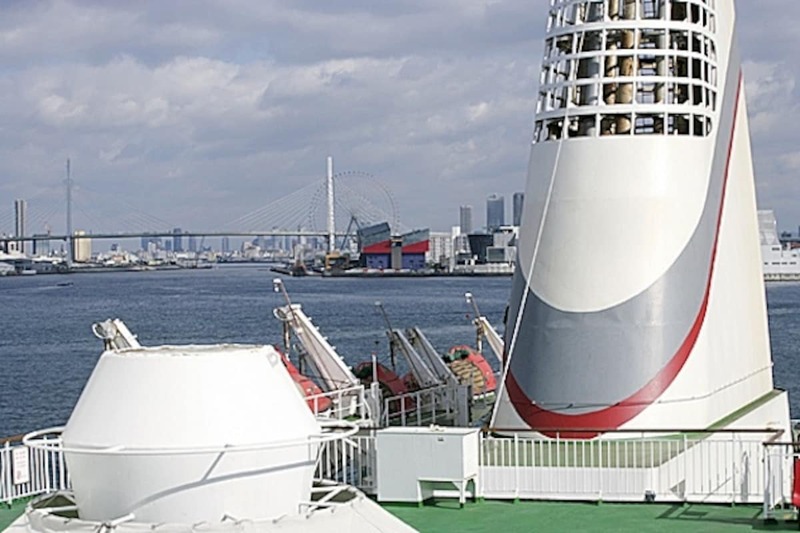 The Xin Jian Zhen departs once weekly on Saturdays, docking in Osaka or neighboring Kobe on alternate trips (the travel time is about the same). The Su Zhou Hao departs Shanghai on Tuesdays and docks exclusively in Osaka. One-way costs for both ferries are the same, ranging from RMB 1,300 (¥20,000) for second class to RMB 1,600 (¥25,000) for first class—or RMB 6,500 (¥100,0000) for VIP. Also be aware that there's a fuel surcharge of RMB 150 (¥2,000). Round-trip fares are also available for all ferries listed here. Home to Russia's largest port on the Pacific, Vladivostok lies just east of Russia's border with China and North Korea. DBS Cruise Ferry operates a single ferry that departs every Wednesday for Sakaiminato in Tottori Prefecture, making a stop in Donghae, South Korea, on the way. It's 19 hours from Vladivostok to Donghae, then (after a 9-hour layover) a further 15 hours to Sakaiminato. One-way tickets range from US$240 (¥24,000) for economy class to US$545 (¥55,000) for a junior suite in first class. You can also embark starting at Donghae for KRW 115,000 (¥9,500) to KRW 320,000 (¥26,500). Be aware that Sakaiminato is pretty far removed from Japan's bullet train lines, and it's about 3.5 hours on local express trains to the nearest Shinkansen station in Okayama. However, if you're open to an unconventional starting point, Tottori is an oft-overlooked gem, known as home to some of Japan's earliest human settlements, with Matsue Castle and the ancient shrine of Izumo located just to the west. Note that there was also once a ferry between Sakhalin Island and Wakkanai in Hokkaido, but it was suspended in 2018, and it's unclear whether it will resume. While the Vladivostok ferry stops in Donghae further north, all other ferries connecting Japan to South Korea depart from Busan, the nation's second-largest city, located on the southeast coast. Busan presents the fastest possible ferry ride to Japan, and there are a number of destinations available. JR Kyushu Jet Ferry operates the Beetle, a jetfoil that travels between Busan and Fukuoka (or specifically, Hakata) two to three times a day, with the first departure from Busan at 8:30 a.m. and the last between 3 p.m. and 3:30 p.m. The trip takes about 3 hours and costs ¥14,000 one-way. Since Hakata is Kyushu's key hub for the Shinkansen (bullet train), for those arriving by ferry, it's an ideal starting point for exploring all of Japan. Another company, Korea Ferry Co., operates the Camellia Line between Busan and Hakata. A much slower ride, it departs Busan in the evening on Tuesdays, Thursdays and Sundays and arrives in Hakata the next morning, taking about 14 hours in the summer and 15 hours in the winter (departure is earlier from November to February). The one-way cost ranges from KRW 30,000 (about ¥3,000) for a four-bed cabin to KRW 110,000 (¥11,000) for a royal suite. Tsushima is a large, scenic island halfway between South Korea and Kyushu, administered as part of Nagasaki Prefecture. The Beetle jetfoil leaves Busan for Hitakatsu Port on the island's northern edge once or twice daily, with the most regular departure at about 12:15 p.m. It costs ¥8,000 and takes about 70 minutes. Korea-based Miraejet operates the hydrfoils Kobee and Nina, which leave Busan at 8:30 a.m. and 9:45 a.m., respectively, taking about 70 minutes at a cost of ¥75,000 (¥7,500) to get to Hitakatsu. The website is Korean only, but the reservation widget is fairly straightforward. Just be aware that 편도 (top right) is "one way" and the first dropdown item at the bottom lists the number of adults. Note that Daea Express Shipping (also Korean only) officially offers a similar service on the Ocean Flower, including a route to Izuhara Port in the south of the island, but its reservation widget does not seem to deliver any results at the moment. Once you get to Tsushima, there are a number of ferry lines in addition to those listed above that can get you from the island and Kyushu proper. Kampu Ferry operates the Hamayuu and the Seong Hee between Busan and Shimonoseki in Yamaguchi Prefecture. The ferry leaves Busan at 9 p.m. and arrives the next morning at 7:45. Prices range from ¥9,000 to ¥28,000, with a port facility charge of KRW 4,300 (about ¥430) and a fuel surcharge of KRW 7,000 (¥700). PanStar Cruise operates a cruise line that leaves Busan at 3 p.m. every Monday, Tuesday and Thursday, arriving in Osaka at 10 a.m. the next morning. Prices on the Korean side can be found here (Korean only), ranging from KRW 161,000 (¥16,100) to KRW 980,000 (¥98,000), plus a fuel charge of KRW 17,000 (¥1,700). If you'd like to make the trip to Japan by boat from North America or from other ports in Asia, you might need to sign on for an ocean cruise. Some focus on Japan, others on Asia in general, and still others will take you all around the world! Holland America Line sails out of Vancouver, Seattle, San Francisco and Los Angeles, as well as Shanghai, Hong Kong and Singapore. All cruises take at least 10 days and start just south of US$1,000 including taxes, fees and port expenses—and rise quickly. Possible ports of call in Japan include Kushiro, Hakodate, Yokohama, Kobe, Nagasaki, Kagoshima, Naha, Ishigaki Island and many more. Royal Caribbean International has cruises to Japan out of Hong Kong, Shanghai and the northern Chinese city of Tianjin, including four-night cruises from Shanghai to Fukuoka, Nagasaki, Kumamoto, Kagoshima or Naha starting around US$630, and a seven-night cruise from Shanghai that stops in Osaka, Kobe and Yokohama for a little over US$1,000. Princess Cruises, on the other hand, offers a number of tours out of Taipei, including a three-day trip to Yokohama for a little over US$400. Other possible ports of call include Nagoya, Kobe and Naha. A convenient summary of cruises going to Japan can be found here. Finally, you can take a freighter to Japan, or to a port that will allow you to connect to Japan—but expect an extremely slow ride. 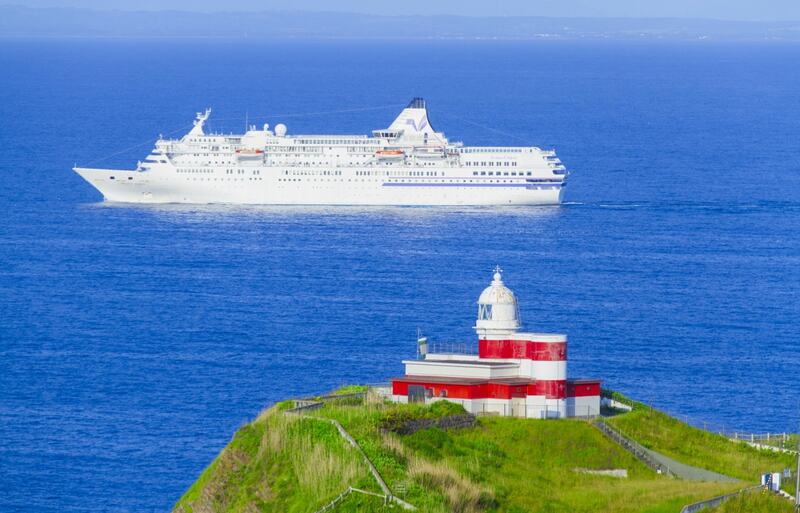 Maris USA offers a number of options on its Pacific and round-the-world routes, as you can book voyage segments for a daily rate of €130 to €150 (about ¥17,000 to ¥20,000) depending on the vessel and cabin style. For example, a 77-day tour out of Hong Kong stops in Shanghai and Busan within the first 10 days, but only hits Yokohama on day 70 on its way back from South America. However, you can board in Manzanillo, Mexico, and cross directly to Yokohama in a more reasonable 17 days. That said, if you do the math, that's actually more expensive and slower than the cheapest cruise ship out of Vancouver, but it does give you the option of staying in Japan as long as you like. Also note that the Mexico stop is the only direct shipping route between North America and Japan; all other options require a transfer to a ferry or cruise line at a port of call in Asia. Meanwhile, Freighter Expeditions offers cargo cruises from just about everywhere in the world, including Australia, Europe and Africa, but disembarkation is only possible at ports connecting to Japan—sadly, the only Freighter Expeditions tour stopping in Japan allows no embarkation or disembarkation in Japan itself. For a more general list of available freighter tours, you can check out the Slowtravel agency, which can hook you up with some of the aforementioned routes and more, including a freighter cruise through southeast Asia that incorporates the Busan-to-Hakata segment. We hope this gives any aviophobes out there (or people who can't fly for other reasons) enough options to let you realize your dreams of coming to Japan! Bon voyage!